Deciding where to have my hen weekend was a little tricky. 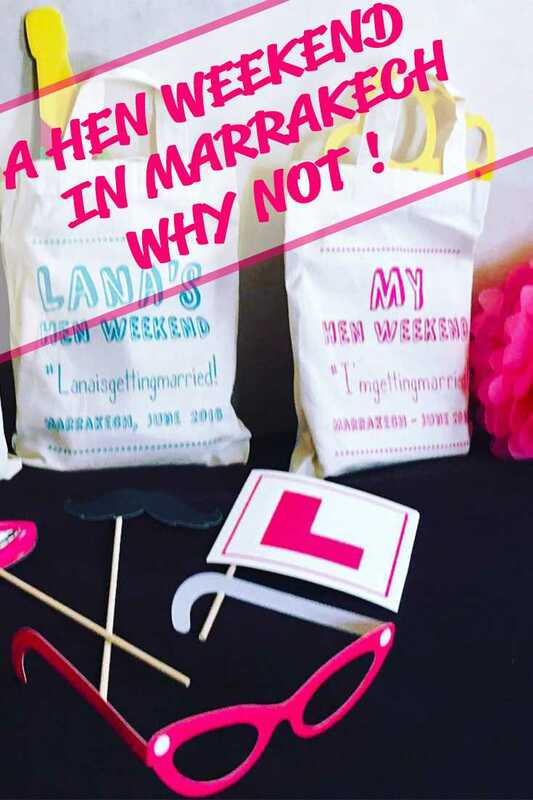 I knew I didn’t want a ‘typical’ hen weekend packed with a naked butler, cocktail making, cup cake making etc etc………it’s just not me. What I was looking for was somewhere I hadn’t been before. 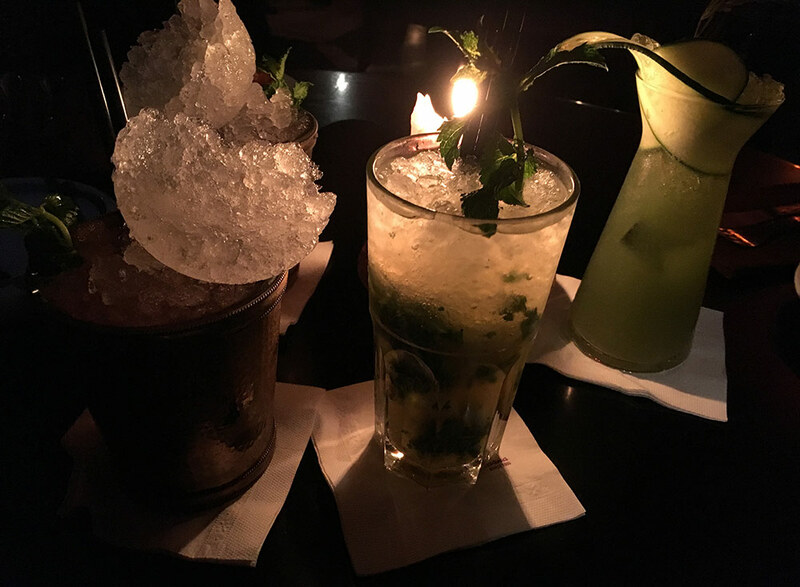 It had to be relaxing, good food, fun times with the girls, but also not too pricey. 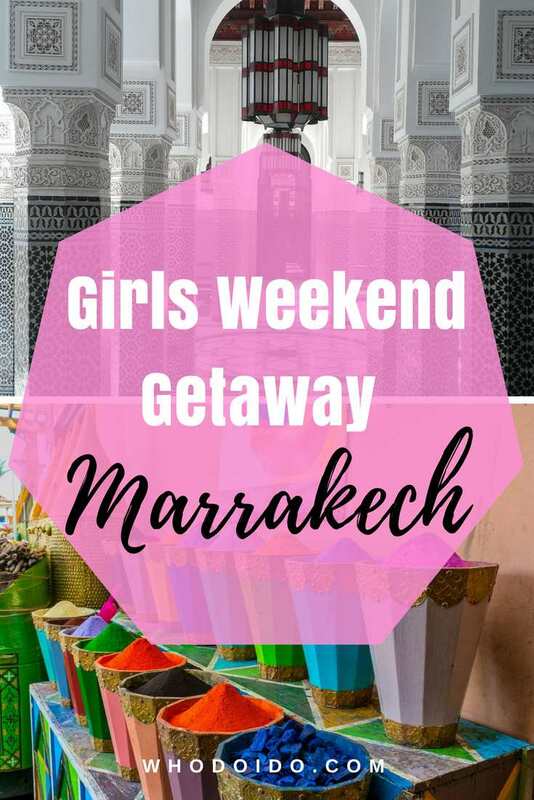 Scouring the internet for non trashy hen weekends was proving to be a challenge, but after a couple of hours I had found it….MARRAKECH! 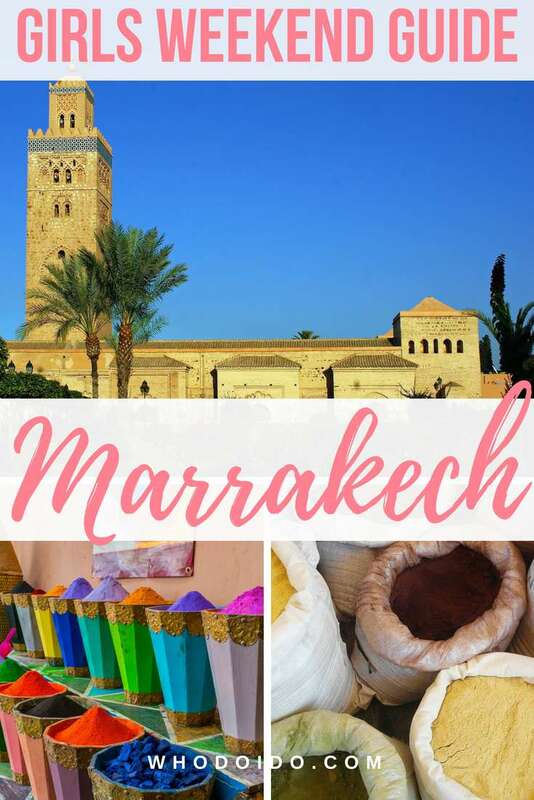 Marrakech was an exotic destination I had always wanted to visit; less than a 4 hour flight from the UK to Marrakech, hot weather in June to top up my tan, very affordable, tasty food (I do love cous cous! ), bit of shopping and fun things to do there. 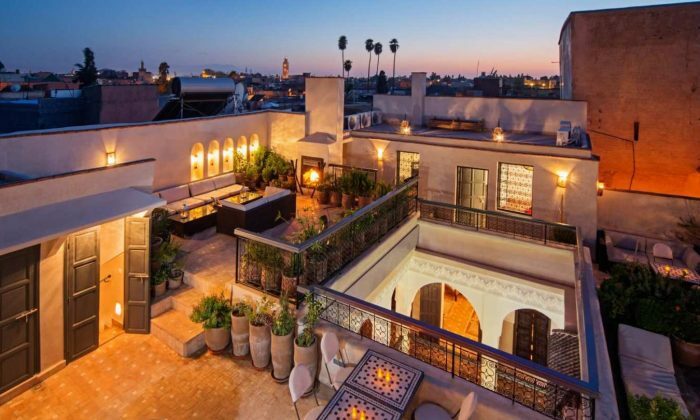 There are many riads and hotels in Marrakech located in the Medina. You’re probably asking yourself..what is a riad? 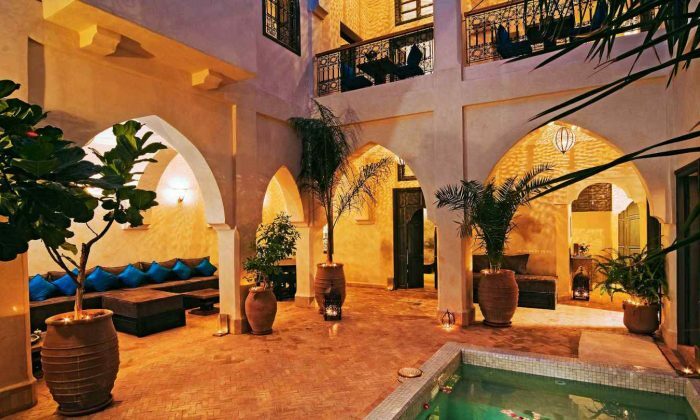 A riad is a traditional house built around a courtyard which has been converted into a hotel. 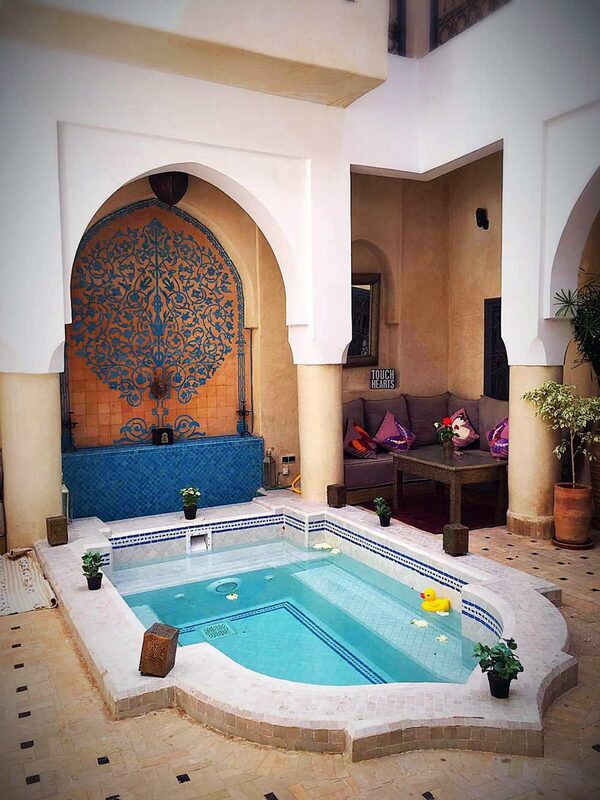 Majority of the riads will have a pool in the courtyard, ideal to cool yourself down in the summer heat. We stayed in the Riad Papillion booked via ‘Marrakech Riad‘. 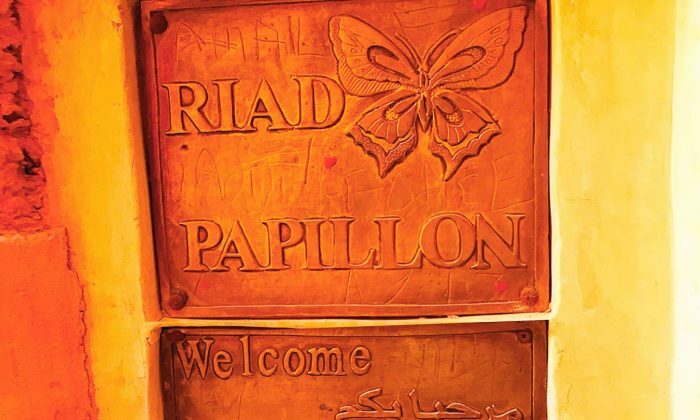 Riad Papillon was a short walk through the old souks to the main square. 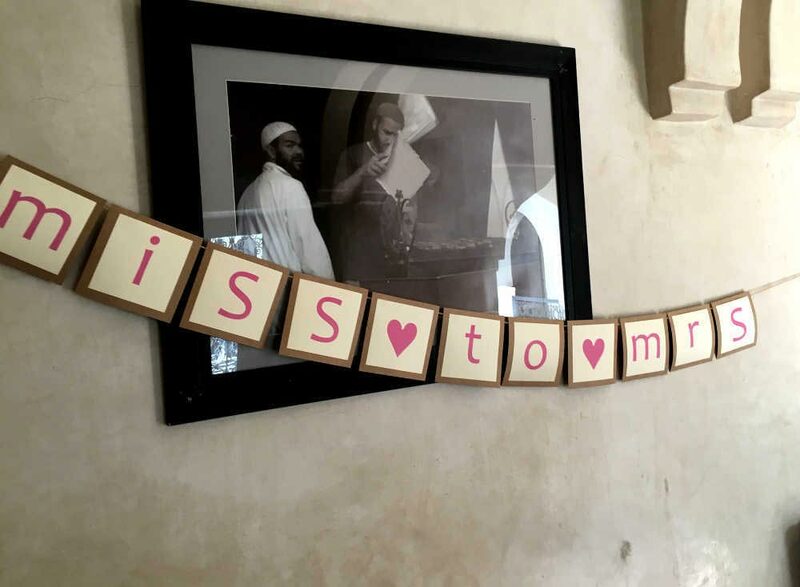 There were five rooms to choose from in the Riad and we stayed in Hibiscus and Geranium on the first floor, overlooking the beautiful courtyard. The rooms were rustic and the little touches in each room made it feel authentic and so homely. 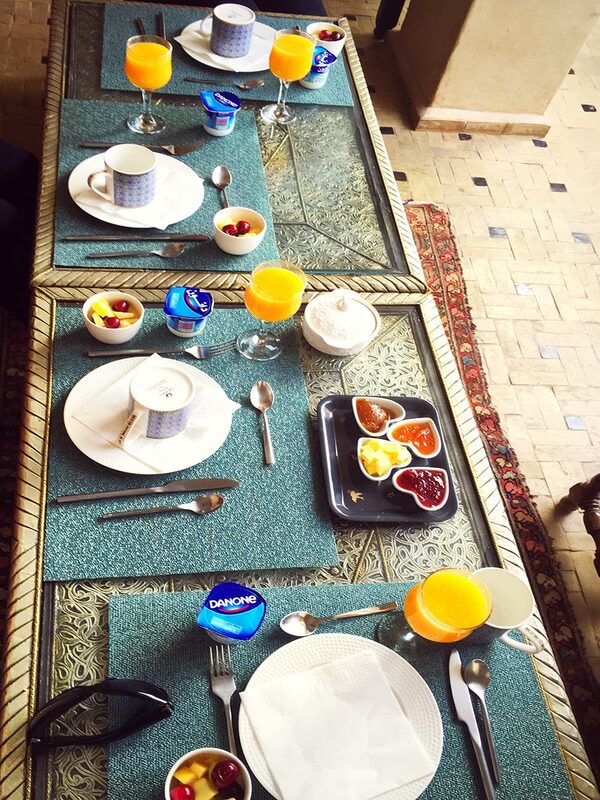 Breakfast included eggs (any style), pancakes, yoghurt, tea/coffee and was served at a time of our choice. 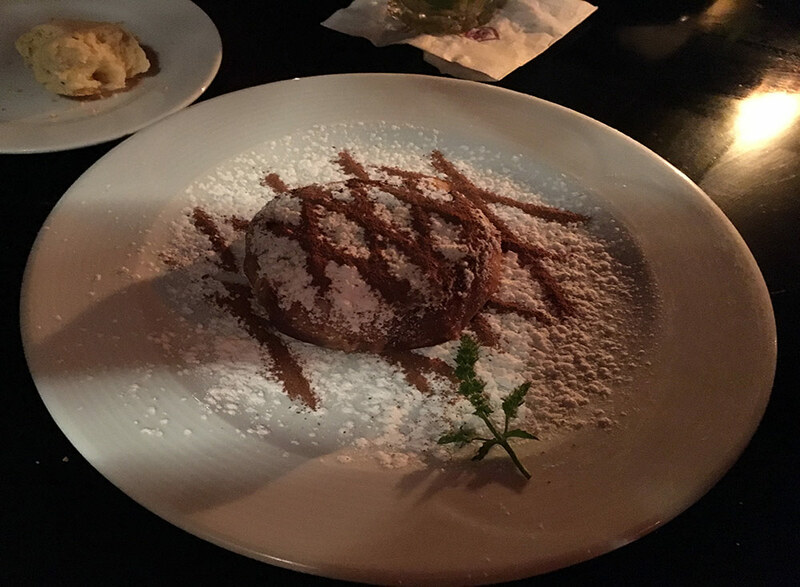 The pancakes were not the fluffy kind… reminded me of Indian roti. 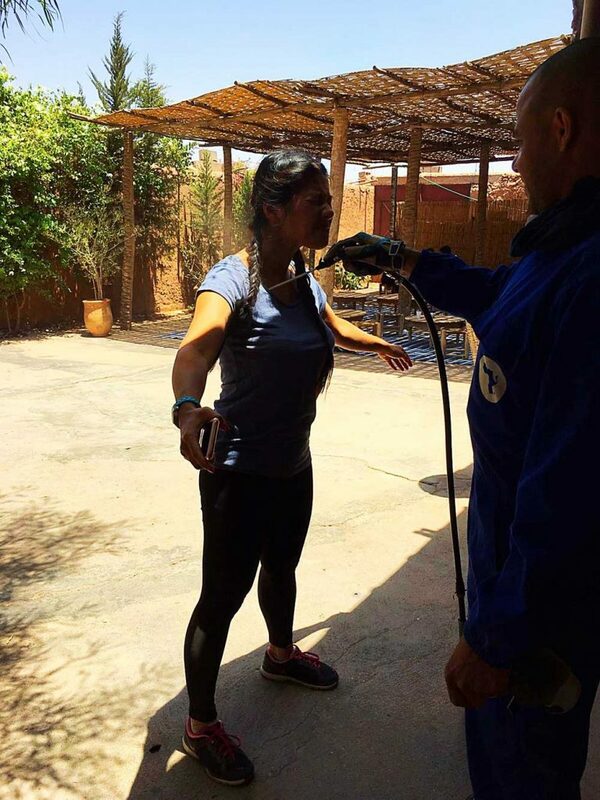 The staff at the Riad were so helpful and went out of their way to accomodate us throughout our stay. 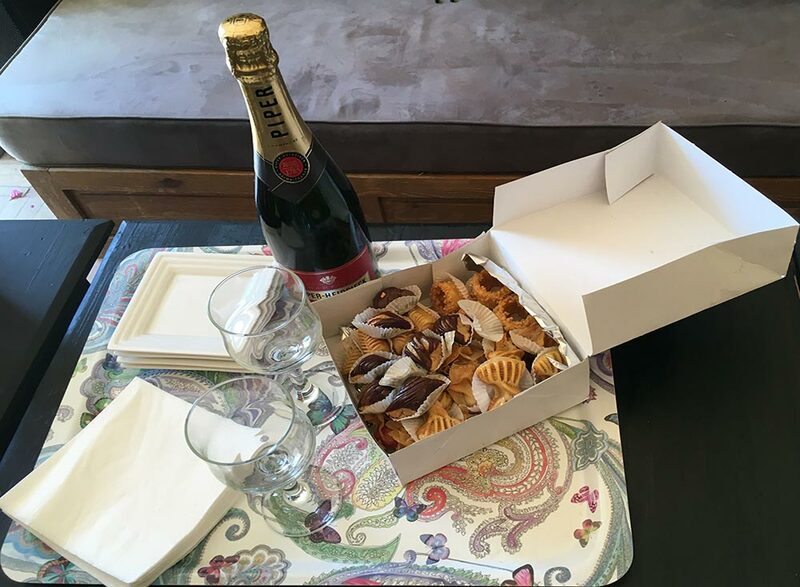 My sister had contacted the Riad ahead of our weekend and had arranged champagne and pastries from a well known pastry shop in Marrakech (Patisserie Amandine). She’s so sweet..aaaahhh! It took us THREE days to eat all the pastries! For an authentic experience I would highly recommend staying in a Riad. 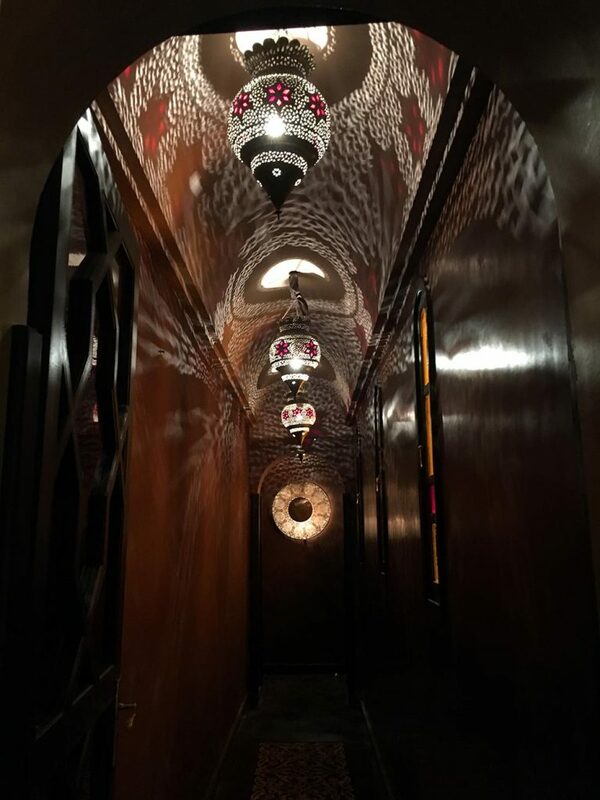 If there is a large group I would recommend hiring the whole Riad for the stay. 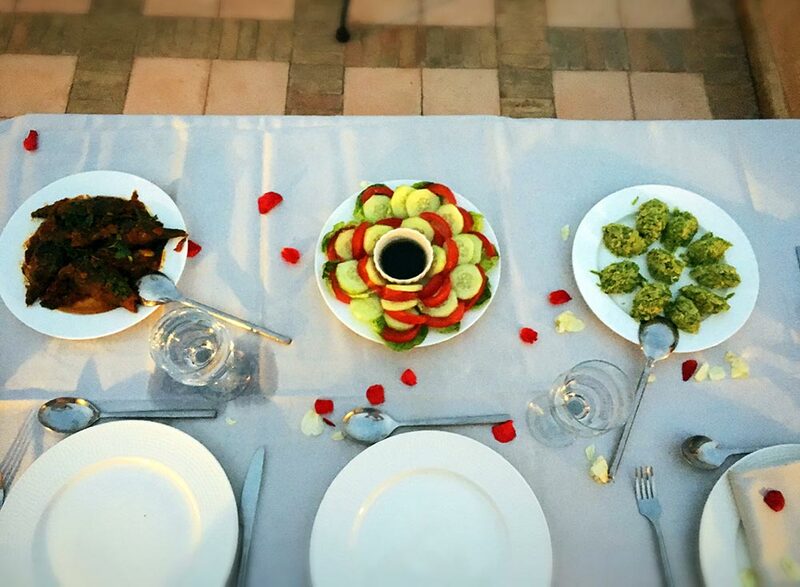 On the first night, the Riad served the evening banquet on the terrace, bathed in light by the fading sun, and surrounded by pot plants – our own secret garden. 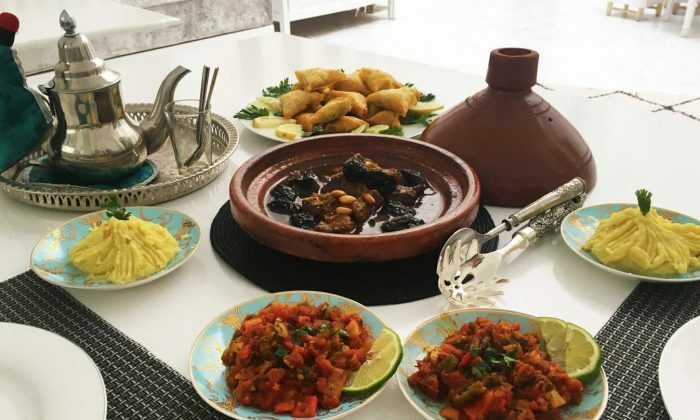 Plates and plates of food were laid on the table… it seemed never ending with a mouthwatering variety of foods from chicken tagine, moroccan salad, baby aubergines, rice with tuna and sweetcorn, local fresh bread and vegetables. As you can guess we just couldn’t finish the mountains of food but we did try! 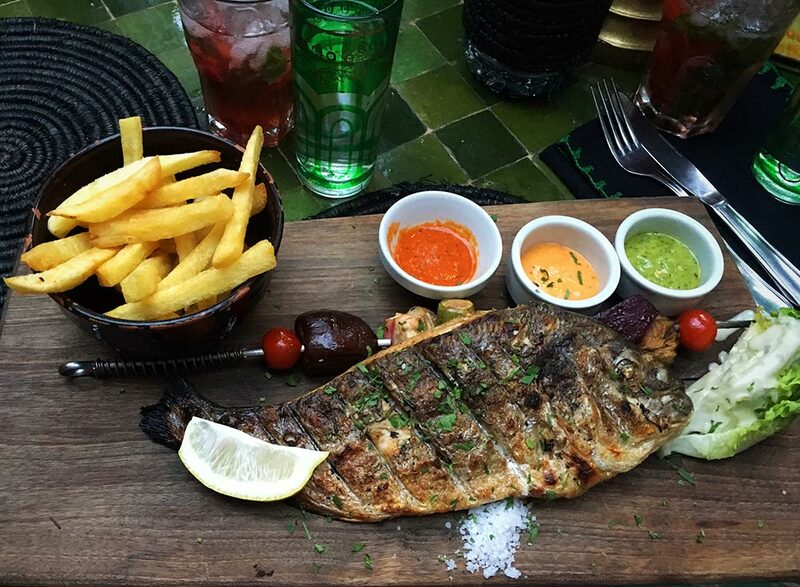 The food was very fresh, full of flavour and ever so tasty. Of course there was dessert..there’s always room for dessert. A healthy plate of of orange slices with a pinch of cinnamon (sounds like an odd combination but trust me they went well!). 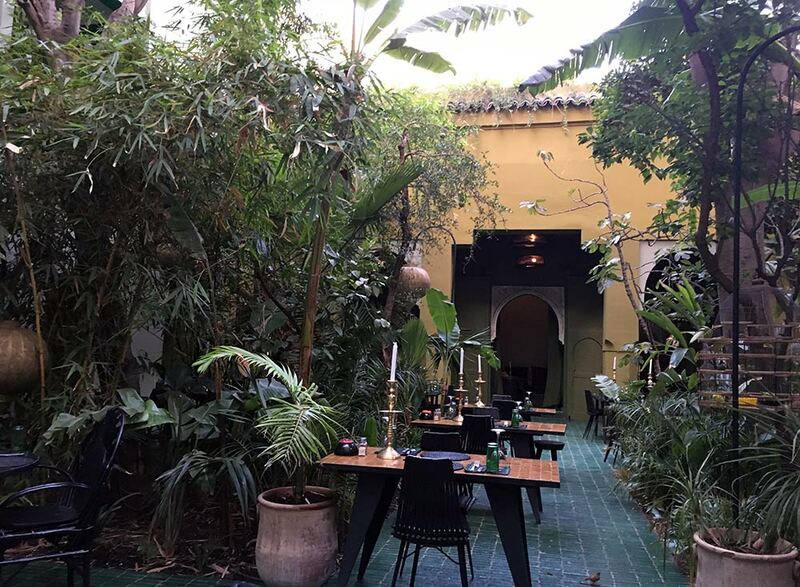 Very easy to find Le Jardin, since the restaurant was clearly signposted in the souks. As we entered through the big wooden door, it was like stepping inside an enchanted garden. 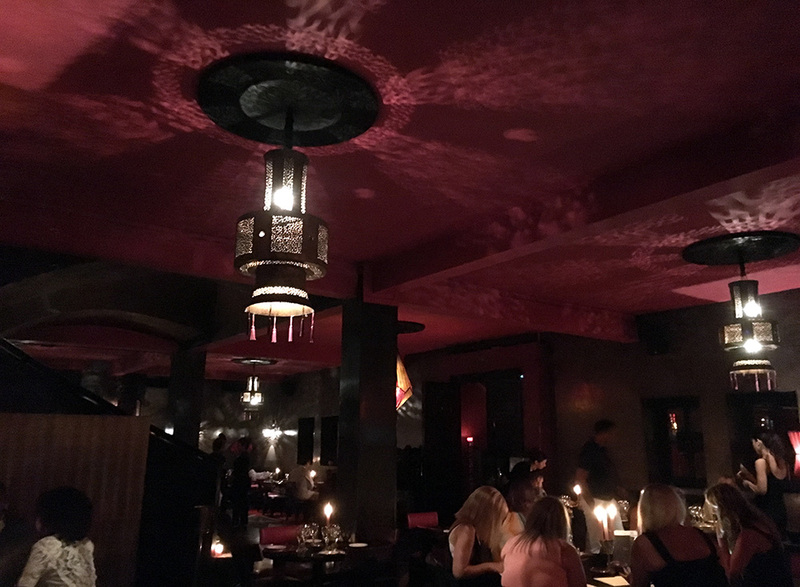 The upstairs of the restaurant wasn’t open till 8pm, but customers were able to wander around and take pics. There was so much to choose from the menu and the food seemed very reasonable. 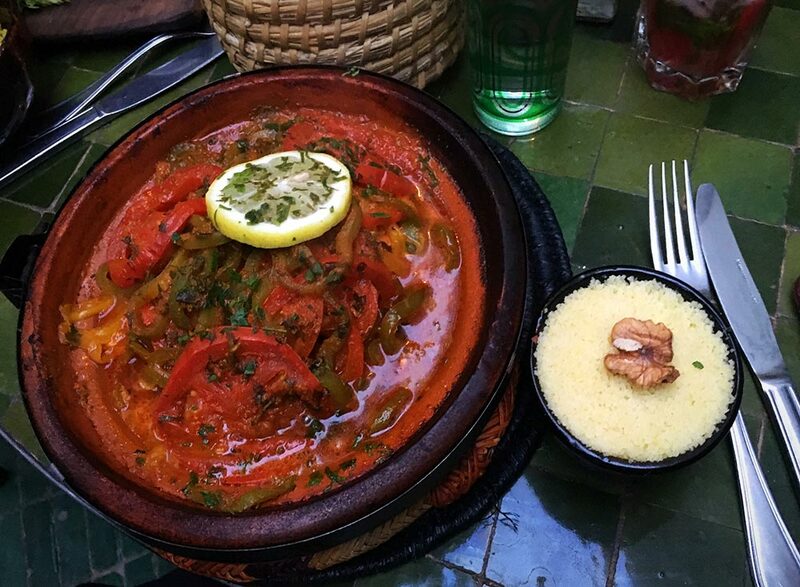 Finally decided on fish tagine, chicken tagine and cous cous. The final night we decided to venture out of the Medina and book somewhere lively for dinner. 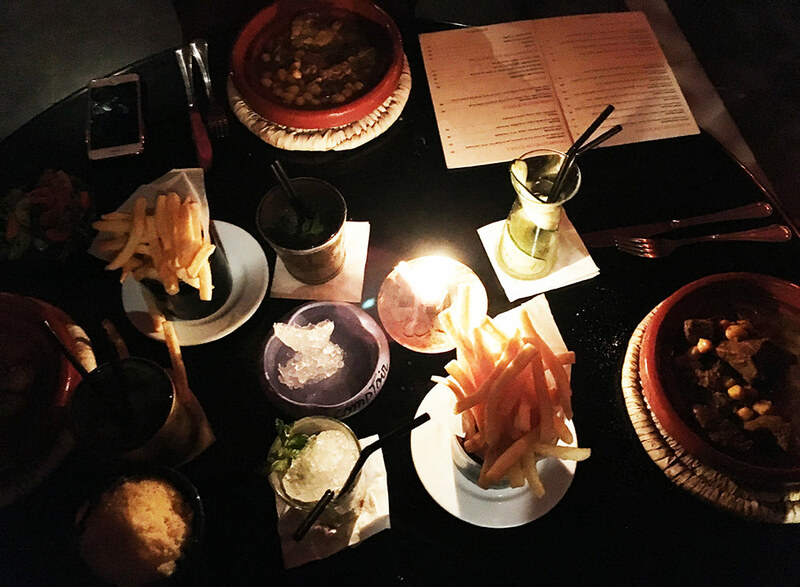 Le Comptoir Darna is known for the live music, belly dancing and shisha. A table was booked for 9pm, as the show didn’t start till 10pm. Here the menu was a bit pricier than Le Jardin, but it didn’t matter as we came for the experience! First course included the chicken and almond pastilla which was so yummy and sweet I could have eaten more. 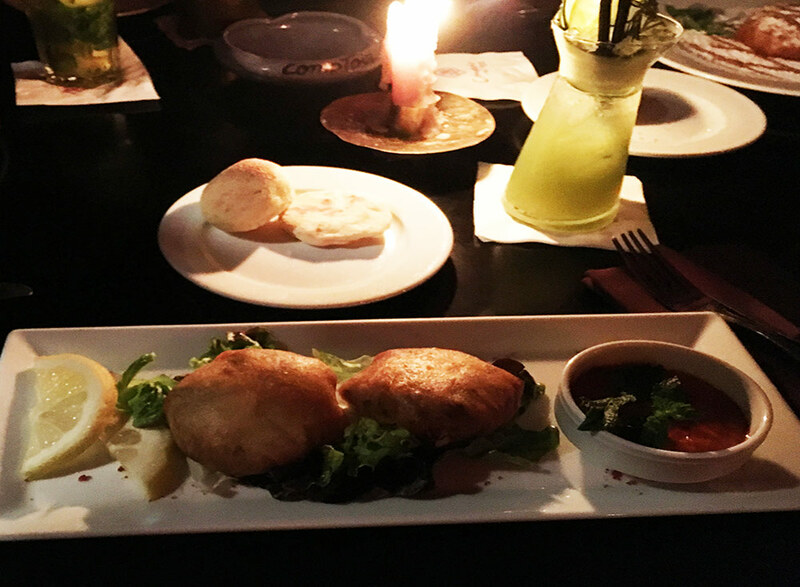 Main chosen was the beef tangier (a traditional Moroccan dish) – the beef was delicious and succulent, soft and tender. Perfect! After having the starter and main, we just couldn’t find room for dessert. So we opted for shisha in the garden lounge area and chose the apple flavour. We all had a go with the shisha..coughing and spluttering haha! A hammam experience is a definite must when visiting Marrakech, however I must warn you not to expect the same spa experience as you would in the UK. We arrived by taxi at Les Bains de Marrakech, checked in with the receptionist and taken to the changing room. We had chosen the 45 minute hammam and a 1 hour relaxing massage for 600DHS. Robes and slippers were provided to us and a locker to leave our belongings. We were split into pairs and taken into a room for a shower before lying down on the beds. Luckily we spoke a bit of French as the ladies hardly spoke any English. Our bikini tops were taken off (well…flung off!) and the ladies chucked buckets of water before scrubbing us down with black soap. The room was filled with steam and were left for a few minutes. Next the ladies came back wearing black kessa gloves to exfoliate our skin and more buckets of water were chucked over us. By this time we resembled drowned rats! A rose ghassoul body mask was rubbed onto our bodies and a green mask for the face and again left in the room. Finally we showered off the body and face mask and led to a huge relaxation room, to chill with a glass of mint tea. After a short relaxation time, we were taken into the massage rooms and were told to take our bikinis off and put on the paper knickers (more like a bit of string!). The massage was bliss and so relaxing that we both fell asleep! Our skin was left feeling smooth and super soft…. not a dry patch of skin in sight. The whole spa experience took roughly 2 hours and 45 minutes and I would definitely go back. Tip: The skin is very sensitive after the hammam, so wear a high factor sunscreen if exposing the skin to sun. 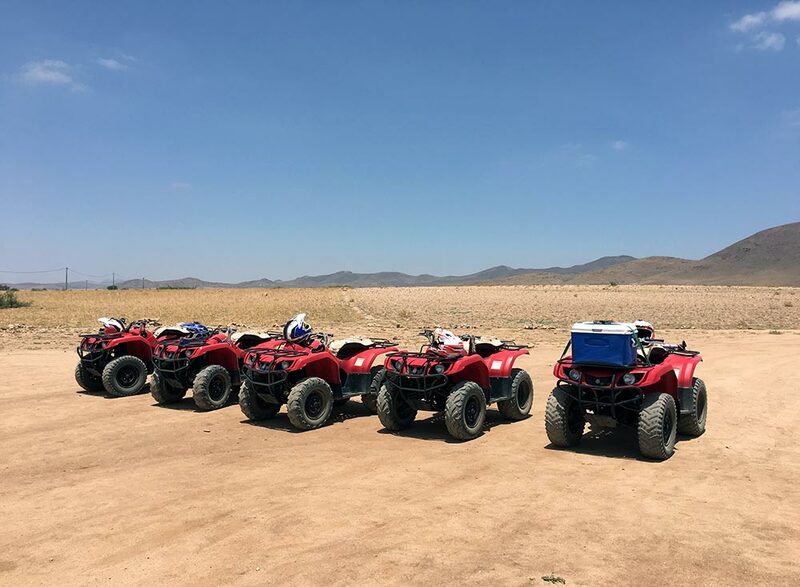 Quad biking was booked with Dunes & Desert Exploration prior to the hen weekend. Picked up at 9am dressed in our leggings, t-shirts and trainers we headed off into the desert ready for our quad biking adventure. After signing the forms we were given a little course to do to get used to the quads. 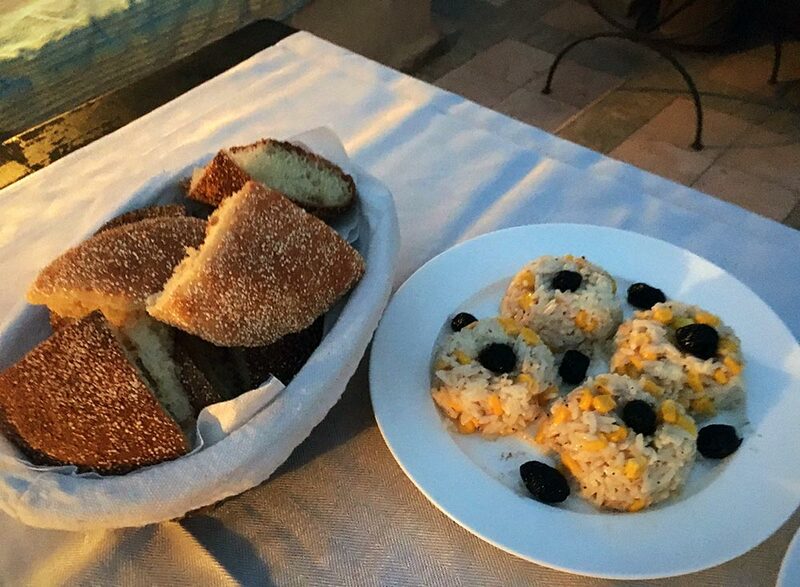 During our ride, we stopped off at a Berber village for mint tea and and the tastiest pancakes drizzled with honey. We did get a little dusty from the quads but what would you expect being in the desert! 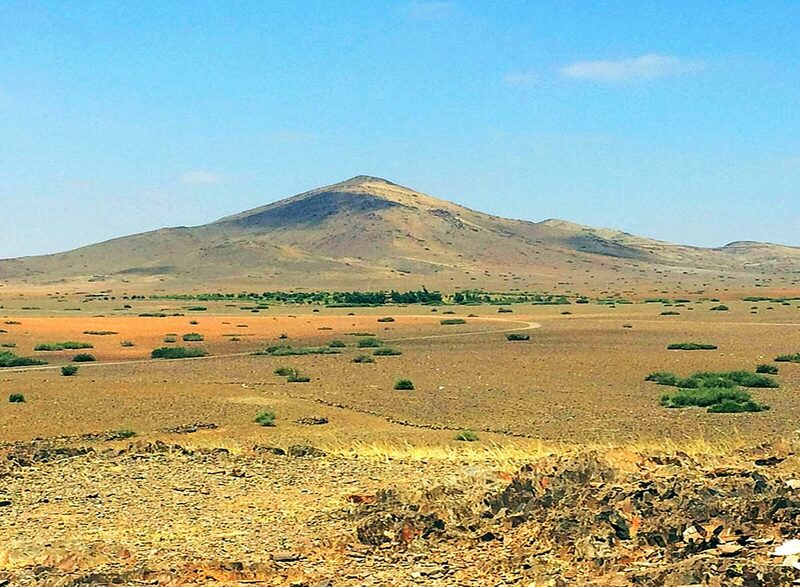 We spent 2 hours in the desert and ready to be dusted off back to the riad. Tip: Wear trainers and leggings as you do get very dusty. Wear sunscreen as it does get very hot out there! Airjet dust off. Boy, did we need that! 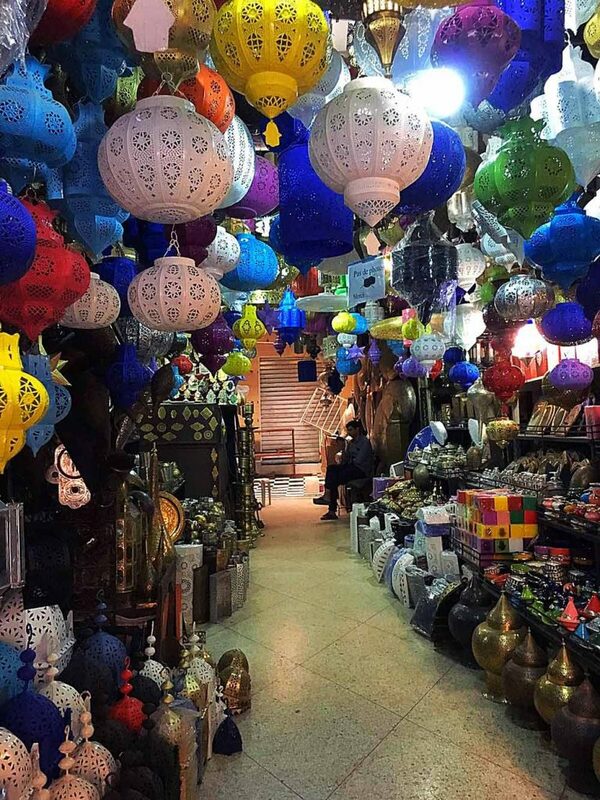 If you love a bargain and do not mind a bit of haggling then visiting the souks will be up your street. I do love a good bargain! Beware that even with a map you will GET LOST through the windy narrow alleys and streets. 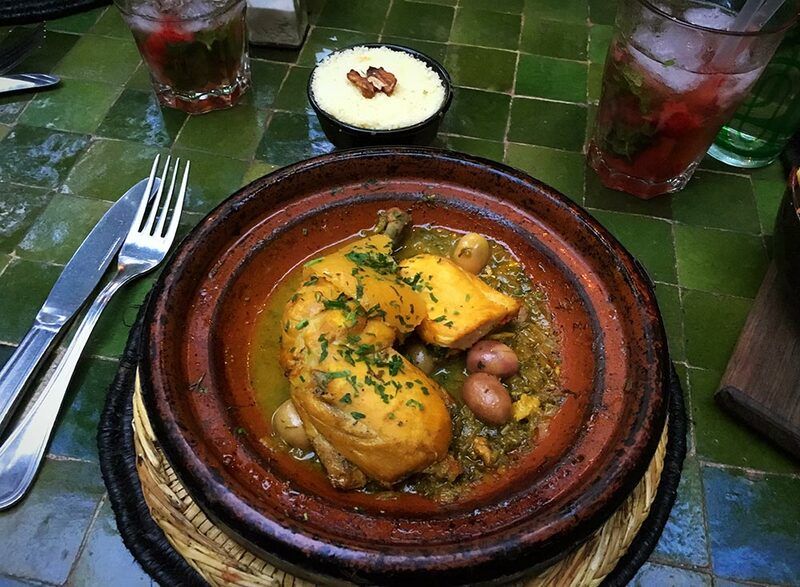 We downloaded the ‘Marrakech Riad’ app which was useful and allowed 10% off cafes and restaurants listed in the app. 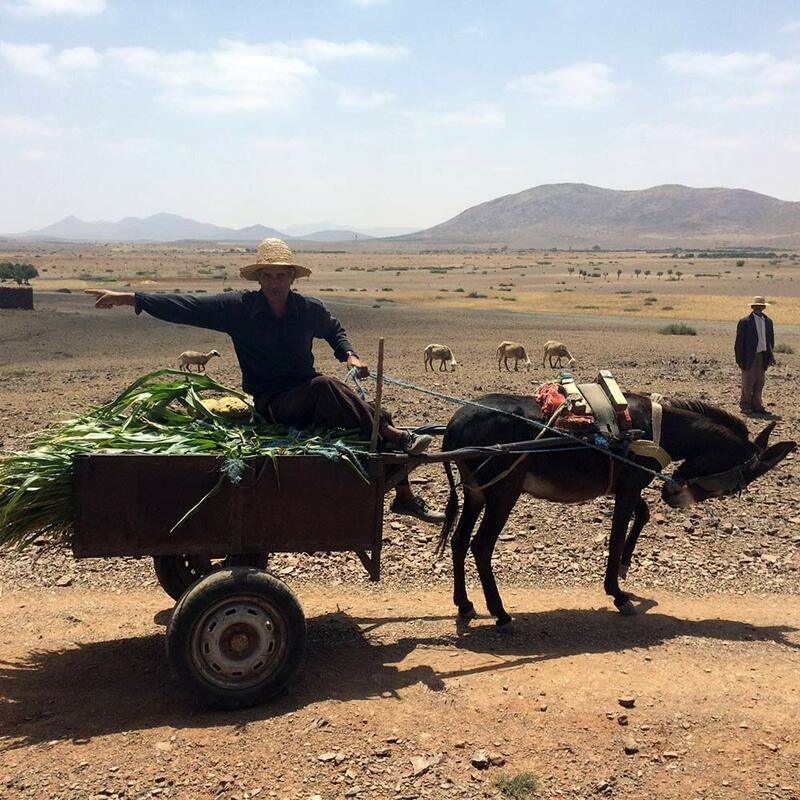 Do watch out for donkeys, mopeds, carts, bicycles when walking in the souks. We ended up taking home quite a few souvenirs ranging from little teapots and glasses to kaftans. 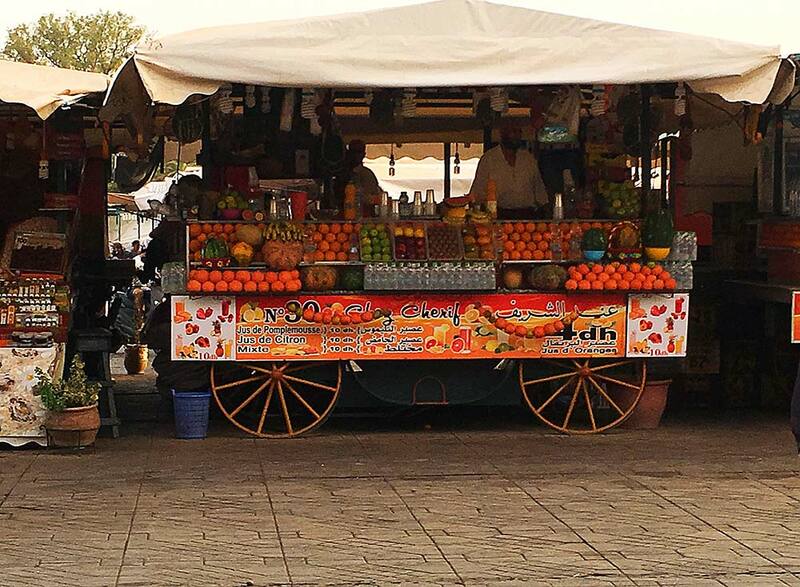 One evening we strolled around the main square and tried some fresh orange juice from the many orange stalls. You can sample the orange juice before buying..I would recommend doing this as some stalls dilute the orange juice with water. 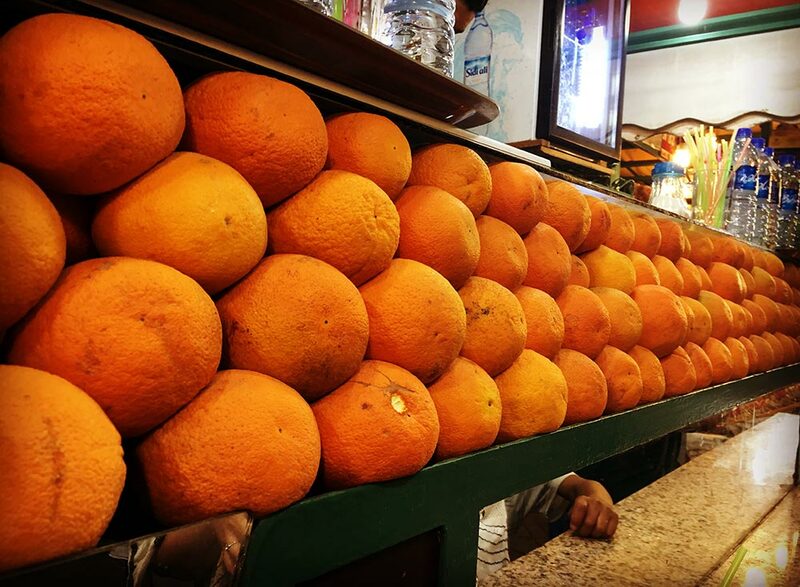 The orange juice was the sweetest – lovely and refreshing! Bring a light shawl/pashmina to cover your shoulders. I covered my shoulders and knees when walking around the souks and the main square, but I did see some women who didn’t. 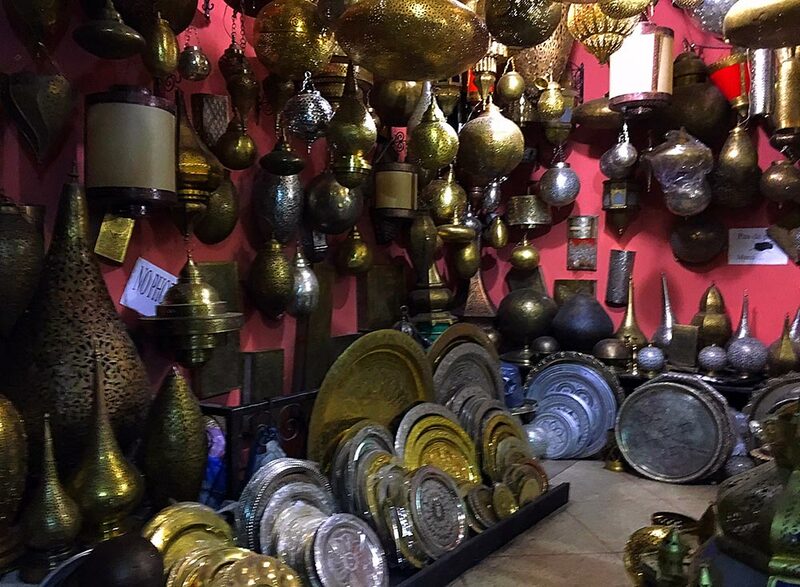 Change your money when you arrive in Marrakech. We exchanged our money at the airport and any Moroccan Dirhams left we were able to exchange back to GBP at the same rate, by showing the receipt. Don’t take directions from strangers/kids or let them lead the way, as they may expect a tip. Best to ask a shop keeper for directions. 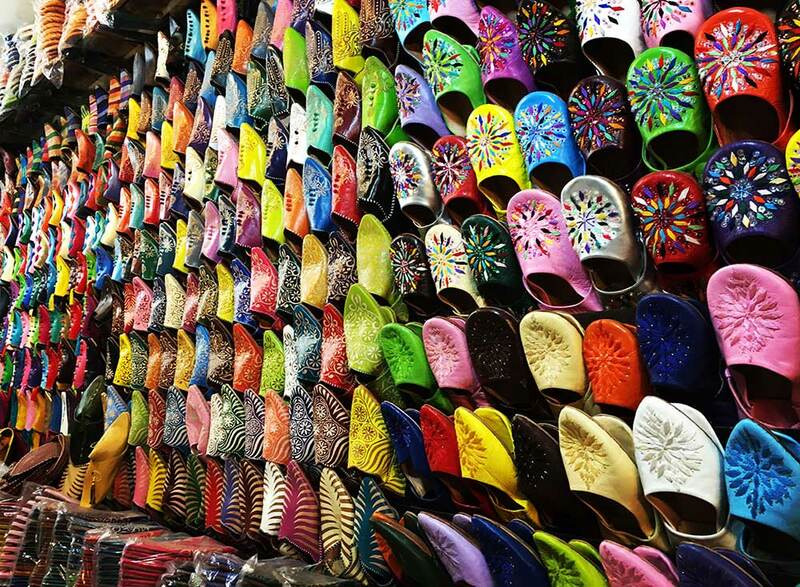 In the souks wear comfy closed toe shoes – you’ll be avoiding the donkeys, carts, bicycles and cats! Be careful when walking down the quiet streets and alleys. 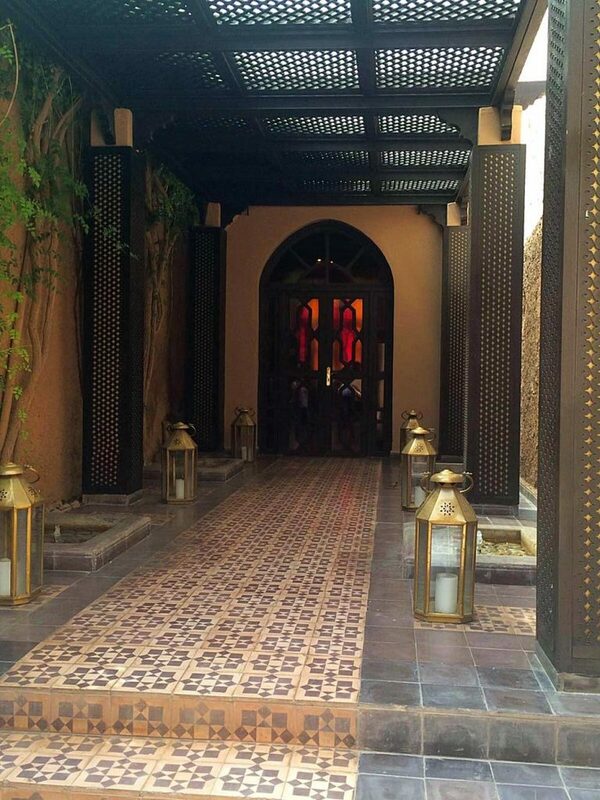 The street where the Riad Papillon was located, there was a security guard who would walk you right up to the door. Otherwise, be safe and have fun in Marrakech! 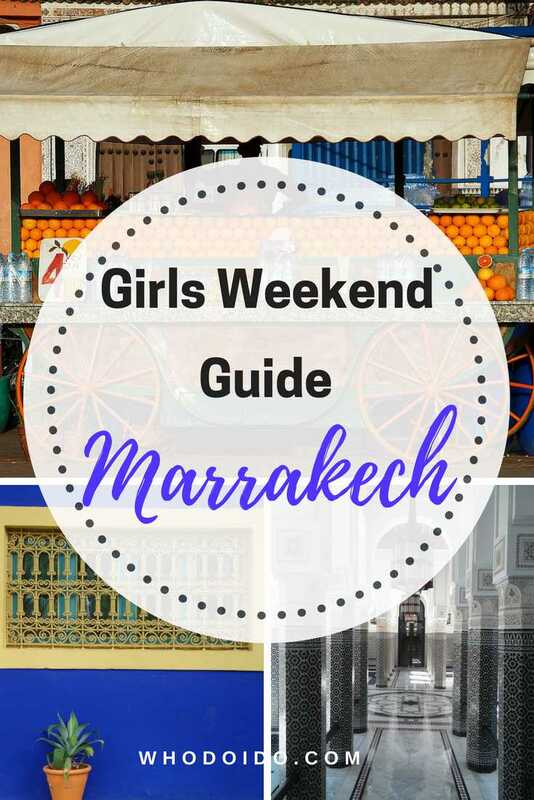 Did you enjoy Marrakech? 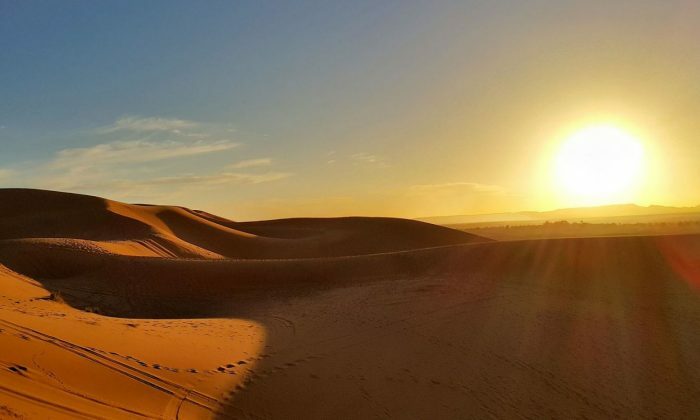 What did you love about Marrakech? 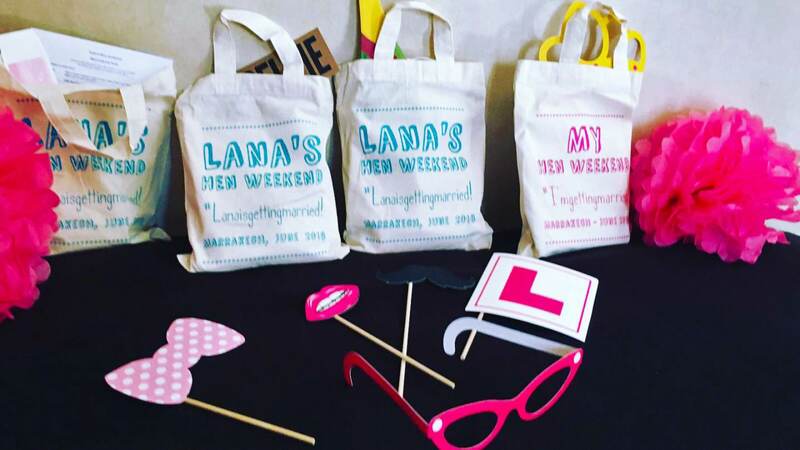 Hiya, looking for a hen do for this June for my sister. Did you experience any Spa treatments within your accommodation? At Whodoido we do not share any personal information with third parties outside our organisation.